This is bad. Trump has nominated Kenneth Marcus – a sworn opponent of Palestinian rights – for Assistant Secretary for Civil Rights in the Department of Education (DOE). Your senator sits on the committee that decides if Marcus gets the job, and we need your help to stop his confirmation. Marcus has a long history of trying to intimidate, silence, and repress college students organizing for Palestinian rights. If he is confirmed for this position, he will have the power to shut down pro-Palestine free speech and boycott, divestment, and sanctions (BDS) campaigns on campuses through spurious claims that criticism of Israel is anti-Semitic. Your senator can help block Marcus’s confirmation. Email them right now to tell them to say no to this Trump effort to shut down campus organizing. A long-time anti-BDS activist, Marcus has explicitly admitted his goal is to use baseless accusations of anti-Semitism to punish student activists for speaking out for justice for Palestine. Under Marcus’s direction, the DOE’s Office for Civil Rights would become a threat to free speech instead of a tool to support it. Like Betsy DeVos at the DOE, Scott Pruitt at the Environmental Protection Agency, Ben Carson at Housing and Urban Development, and others, Marcus’s nomination is designed to undermine the very protections this office is supposed to uphold. Trump’s nomination of Marcus is a concrete manifestation of his campaign’s stated promise to investigate college students organizing for Palestinian rights through BDS campaigns. Read more about Marcus’s problematic positions here. Even beyond his attempts to crush the campus movement for Palestinian rights, his civil rights record is unconvincing. At a time when marginalized groups such as people of color, LGBTQIA folks, Muslims, and immigrants – and especially those who live in the intersections of those identities – are under real threats to their safety, Marcus’s record shows him more likely to defend white, male students supposedly facing bigotry. It is up to us – and your senator – to stop this threat to the movement for Palestinian rights and expose the systematic campaign of repression at work. We need to change the narrative to one that uplifts work for justice on college campuses and around the world, instead of one that stigmatizes it. 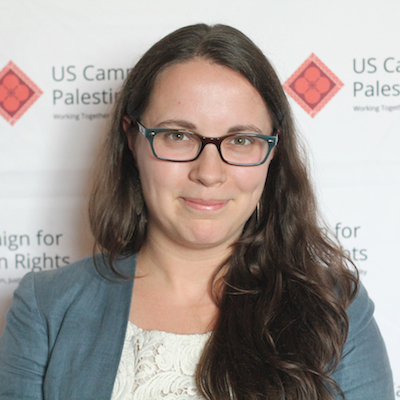 The nomination of an anti-Palestinian, anti-free speech activist to the DOE poses threats to our organizing for Palestinian rights, but it is also an opportunity to again show the power of our voices. It will take a massive outcry to block or slow this nomination, so we need to take action – and spread the word – now. We will not let student activists be silenced. Please take action to stop Marcus’s confirmation by contacting your senator today.